Its CarNama not KarNama. In order to gain new customers and to retain existing customers Zong has come up with a consumer promotion that will trigger the overall usage of Zong subscribers and give them an opportunity to win different prizes. This time the prizes include 5 Honda Civic Cars & 40 70cc Bikes for such Zong prepaid consumers who consumes balance of Rs 200 + tax till 25th Nov. The consumption of balance is effective from 23rd of October up to 25th of November, 2012. Take a chance and try your luck. Consume Rs 200 + tax from 23rd Oct till 25th Nov to become eligible for the lucky draw. Winners will be selected by a Lucky Draw. The winners will be contacted by ZONG itself via call, Please do not entertain any calls or SMS asking for credit transfer or balance load/share to win the prize. Date of Lucky Draw: The lucky draw will be held on 26 November 2012. ZONG will not be responsible for any loss that may occur due to any such activities. The promotion will be run from 23rd October, 2012 to 25th November, 2012. Zong employees, their family members and employees of related organizations cannot be a part of this lucky draw. ZONG's decision(s) related to the lucky draw will be deemed final. 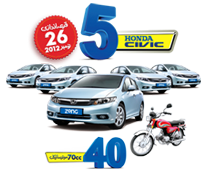 Honda Civic Cars & bikes model will be finalized by Zong. To avail the prize it is mandatory that the SIM is in your name. Prizes cannot be exchanged or transferred in any situation. Car/bikes delivery is dependent on the delivery schedule of the manufacturing company. All documentation and expenses pertaining to the registration of the prize car will be the winner's responsibility. ZONG keeps the rights to advertise the winners.